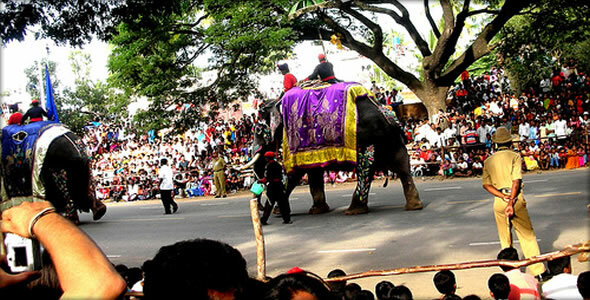 Mysore Dasara is a popular event in Karnataka State, South India, a world famous festival lasting all through 10 days. The city of Mysore will look at its best during the festival, with all the major roads in the city, heritage buildings, palaces, historical monuments, ancient temples and shops illuminated. Here the Dasara is an elaborate affair and attract a large audience including both local and foreign tourists. According to the legends, Dasara is celebrated as a victory of Goddess Chamundeswari over the demon Mahishasura. The 10th day of the festival – the most auspicious day of the Dasara – is Vijayadashami, which is symbolically celebrated as the victory of good over evil. This final event of the festival usually falls in the month of September or October. This historical festival started during the period of Vijayanagar Kingdom in 15th century. Later, the Mysore Wodeyars carried over the tradition of Vijayanagara rulers. After the fall of Tipu Sulthan, the Wodeyars shifted to Mysore and continued the tradition. 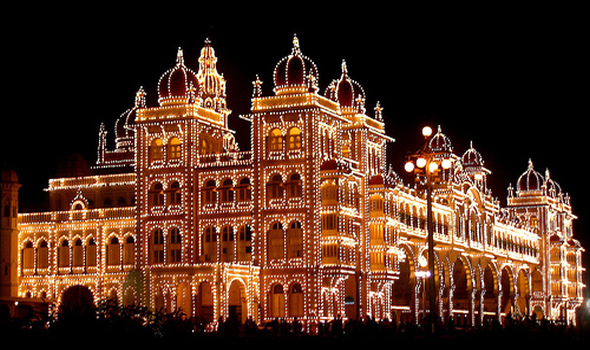 The Dasara festivities are held at the Mysore Palace, Jaganmohan Palace, Kalamandira and the Town hall. Renowned artists in classical music, dance and folk perform during this festival. Apart from cultural events, sports and wrestling events are also there to entertain the viewers. However, the main attractions of Dasara are the colourful procession of Goddess Chamundeshwari on the decorated royal elephant, torchlight parade and the exotic fireworks at Bannimantap and exhibition. Dasara (Navaratri) starts on the first day of Ashwija month, and it ends with the world famous Jambu Savari on the last day. 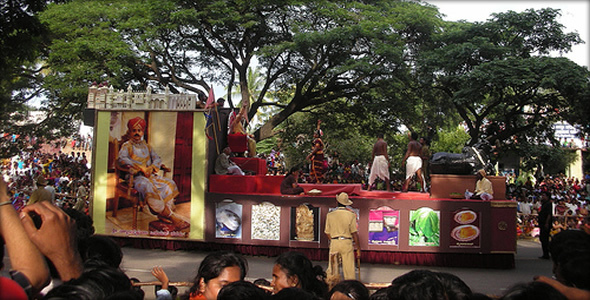 Colourful tableaux, folk dancers, music bands, decorated elephants, horses and camels form a part of the procession. Dolls are also arranged in the houses in an artistic way, and illuminated. On Vijayadashami, the traditional Dasara procession is held on the streets of Mysore city. The main attraction of this procession is the idol of the Goddess Chamundeshwari which is placed on a golden mantapa on the top of a decorated elephant. Colourful tableaux, dance groups, music bands, decorated elephants, horses and camels form a part of the procession which starts from the Mysore Palace and culminates at a place called Bannimantap where the banni tree is worshipped. The Dasara festivities would culminate on the night of Vijayadashami with an event held in the grounds at Bannimantap called as Panjina Kavayatthu (torch-light parade). Another major attraction during the festival is the Dasara exhibition which is held in the exhibition grounds opposite to the Mysore Palace. This exhibition starts during Dasara and goes on till December. Various stalls which sell items like clothes, plastic items, kitchenware, cosmetics and eatables are set up and they attract a significant number of people. A play area containing attractions like Ferris wheel is also present to provide entertainment to the people. Various Governmental agencies setup stalls to signify the achievements and projects that they have undertaken. About the Author. Lakshmi Menon. Lakshmi Menon writes articles on various topics, including South India tourism. Please visit her website for more information on her background expertise and services.